Become the BEST in YOUR GYM: How to become the BEST by uniting 10 different realms of fitness into one ALL OUT 8-week program. 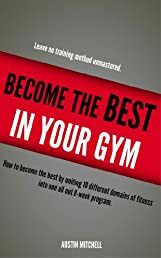 Learn how to become the best in your gym by combining every type of training in to one beast workout plan! What Do I Need To Know Before I Start The Program? What Is The 8-Week Program? How Can I Train To Look Like A Bodybuilder? How Can I Become Stronger? How Can I Increase My Grip Strength? How Can Become Quicker And More Agile? If you are an athlete or just like to train like one then this is for you! You could go out and spend $600 to $1000 on a Personal Trainer to try to get all of this information. But you wouldn't get half of the training from them as you would from this program! This 100'ish page quick read is a real roadmap to becoming the athlete you want to be.